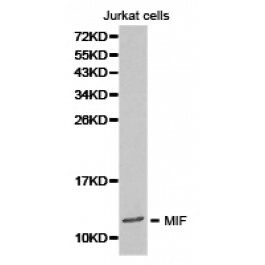 Recombinant protein of human MIF. Macrophage migration inhibitory factor, known as MIF or glycosylation-inhibiting factor, is a secreted, homotrimeric, pro-inflammatory cytokine that modulates macrophage and T cell function and is an important regulator of host response to infection. MIF is expressed at sites of inflammation, which suggests that it plays a role in regulating macrophage function in host defense. MIF is produced by the pituitary gland and is found in monocytes, macrophages, differentiating immunological cells in the eye lens and brain, and fibroblasts. 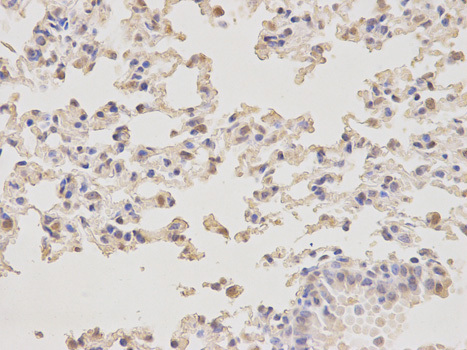 Elevated levels of MIF protein are detected in the plasma of patients with severe sepsis or septic shock, a condition where MIF influences endotoxic shock by enhancing the production of other inflammatory cytokines including tumor necrosis factor å (TNFå), interleukin-1 (IL-1) and interferon-© (IFN-©). MIF promotes the systemic inflammatory response by counter-regulating glucocorticoid-mediated inhibition of immune-cell activation and proinflammatory cytokine production. MIF may mediate tissue destruction through the induction of proteises.